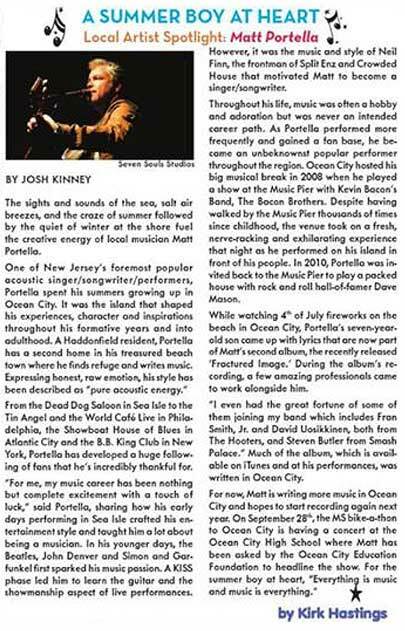 Anyone who regularly catches shows at Sea Isle City’s Dead Dog Saloon or attends radio station WZXL’s special party events, knows Matt Portella. The singer has been playing the Philadelphia and southern New Jersey shore areas for decades, all while maintaining his career as a lawyer. So a guy with that background should be able to handle a little thing like opening for a rock great like Dave Mason. “Nervous? Naahh,” he laughs. “I live for this. Of course, I’m nervous. It’s pretty exciting. I mean hands down this is one of the most thrilling things I’ve done. I’ve opened for the Bacon Brothers, so I’ve done big shows, but this is a Rock and Roll Hall of Famer. Any time you get to do something like that, you’re going to be honored and thrilled. Portella, of Haddonfeild, got the gig due to his connections to the Ocean City Education Foundation, which has brought in Mason for a fundraising concert Oct. 2 at the Ocean City Music Pier. Portella has found a way to combine his two careers. Portella also found that playing in bands wasn’t his thing. Rather, he prefers to be up there alone with his guitar. In the case of this concert, however, he’s avoiding one song in his repertoire. “When I perform at the Music Pier, I’m going to do a set of original music,” he says. “But when I do covers, I do sometimes sing ‘We just Disagree’ [Mason’s signature solo hit]. But I don’t think I do it justice. He sings that song so beautifully. 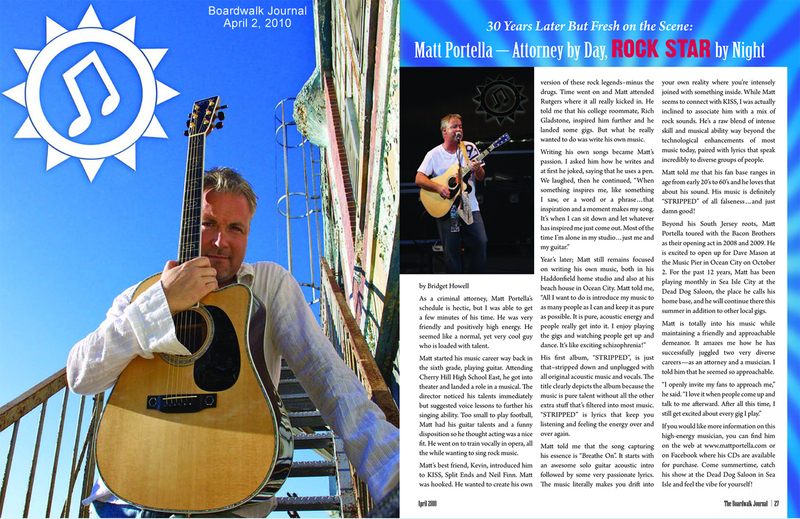 Lawyer by day, musician by heart — South Jersey local Matt Portella releases his latest album titled Fractured Image sharing bits and pieces of life, love and hardships. Discovering new music can lose its glimmer if it mimics what’s been done in the past but after hearing several songs from Portella, I realized one thing – I could not initially categorize his sound. I was intrigued by this notion because it’s rare to find something so unique. It’s a mix of some acoustic bits, guitar breakdowns and coming full circle to clear, heartfelt vocals. A down to earth guy who was gracious enough to include me on the making of his new album from recording the songs, to shooting a music video, and finally to his album release party where he will debut everything to the masses. Early Years: Too small to play football, Portella decided to try theatre and chickened out for his first show but eventually landed a small part as a clown in the show Barnum. Lessons with one of the directors taught him singing technique but despite his love for theatre and music, he always knew he would become a lawyer.The first song he wrote and recorded was in college on his roommate’s four-track recorder. He began playing mostly acoustic his senior year and kept up with it through law school for anyone who would listen. Musical Influences: As a kid, his father introduced him to the music of Russian opera singer Ivan Rebroff. It’s from Rebroff’s style that he developed his unique baritone vocal sound. Portella’s real passion to become a rock star musician was initially because of KISS; captivated by the face-painted group. Other inspirations include Neil Finn, Jeffrey Gaines, Simon and Garfunkel, and acoustic based artists such as Duncan Sheik. On the Album: “The first line of one of the songs “Point of No Return” is, ‘standing at the edge again.’ You’ve got to make a decision. We’ve got to do something. Are you going to do the right thing? Are you going to do the wrong thing? Are you going to do the thing that’s more comfortable to go with? Are you going to try something new? Are you going to completely mess up? Are you going to do the stupid stuff that you’ve done in the past? Can you think outside the box and/or do the right thing?” This is an example of Portella’s introspection, a theme which recurs throughout the tracks on the album. 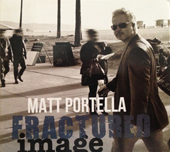 Partly recorded locally and partly in California, Fractured Image defines who Matt Portella is as a person and as an artist. Top songs on the album include “Boys” (inspired by his sons), “Funeral”, and his first single “Three (Everyday)”. The record has something for everyone no matter what genre you’re into. He has succeeded in producing a vibrant, appealing album from beginning to end and it comes highly recommended.